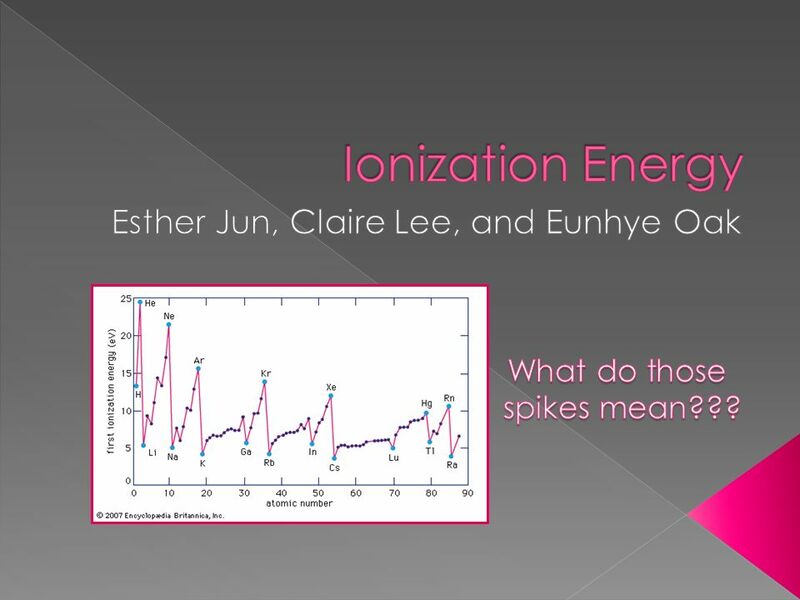 Ionization Energy Esther Jun, Claire Lee, and Eunhye Oak What do those spikes mean??? 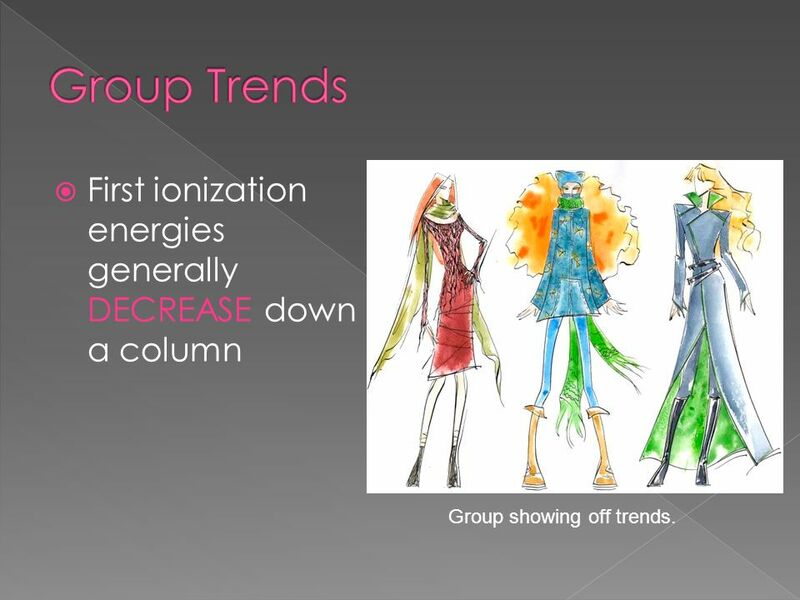 3 Group Trends First ionization energies generally DECREASE down a column Group showing off trends. 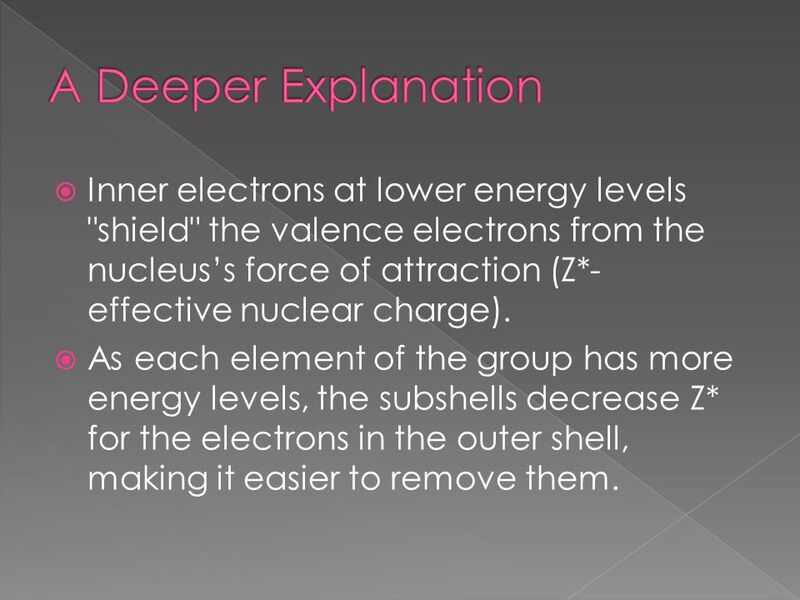 5 A Deeper Explanation Inner electrons at lower energy levels "shield" the valence electrons from the nucleus’s force of attraction (Z*- effective nuclear charge). 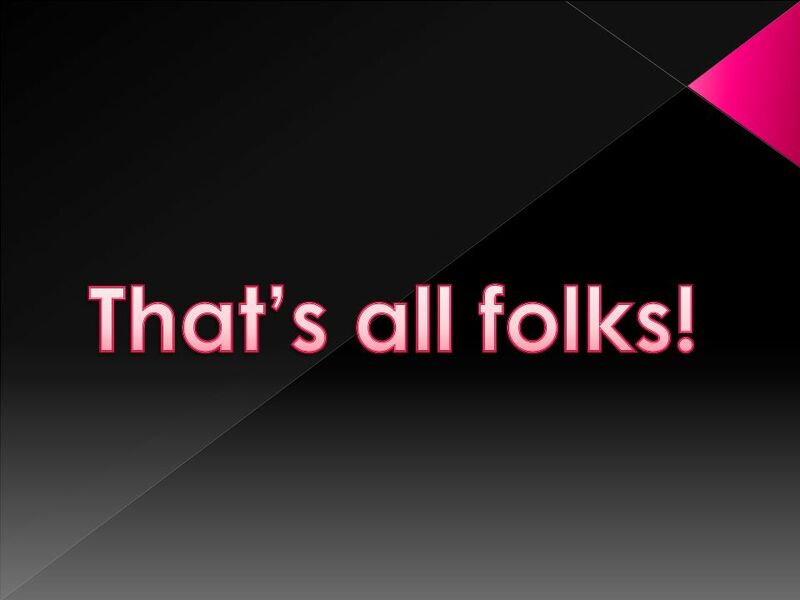 As each element of the group has more energy levels, the subshells decrease Z* for the electrons in the outer shell, making it easier to remove them. 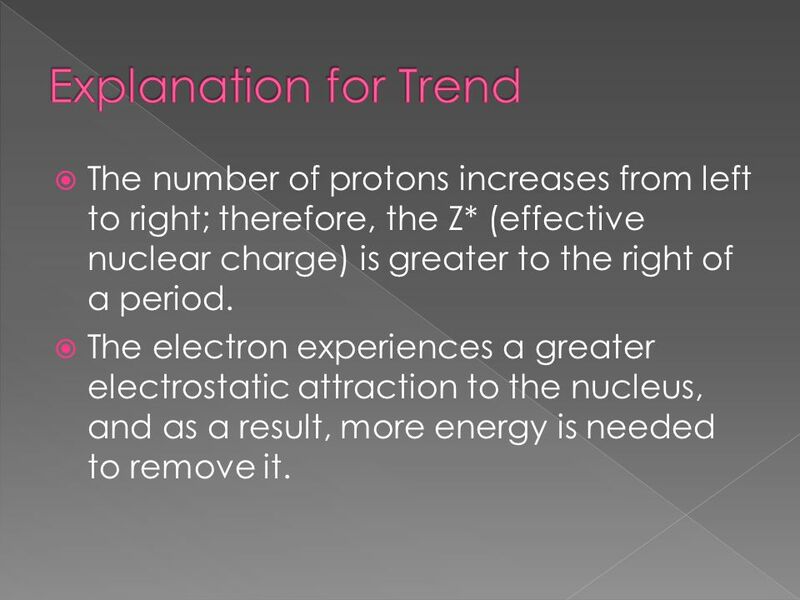 7 Explanation for Trend The number of protons increases from left to right; therefore, the Z* (effective nuclear charge) is greater to the right of a period. The electron experiences a greater electrostatic attraction to the nucleus, and as a result, more energy is needed to remove it. 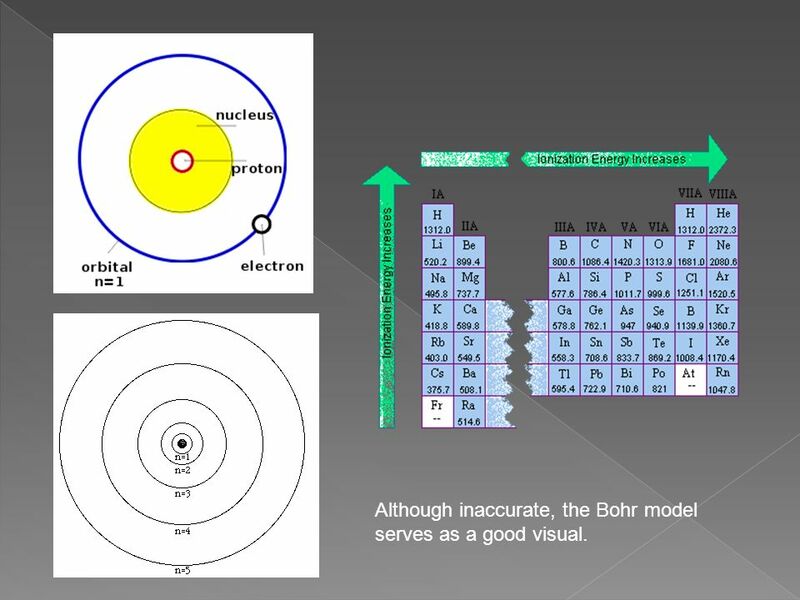 8 Although inaccurate, the Bohr model serves as a good visual. First ionization energies from left to right across this period generally increases. 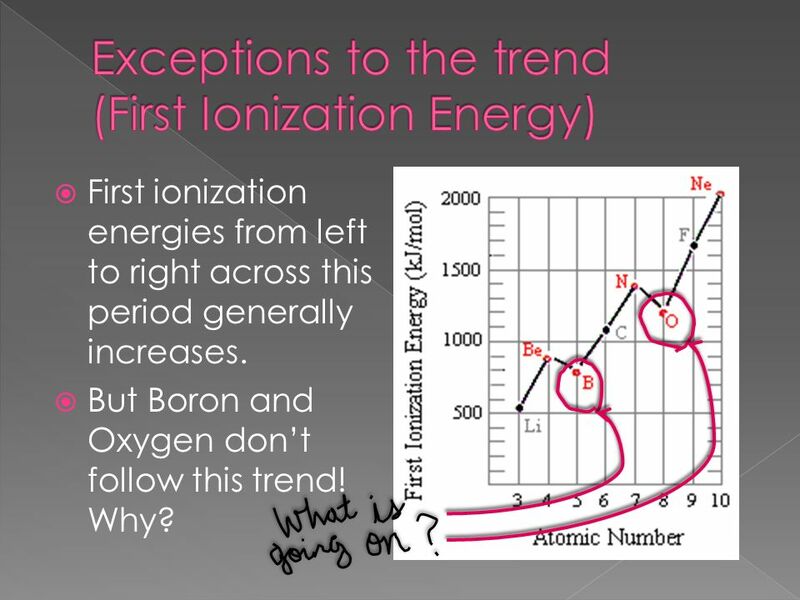 But Boron and Oxygen don’t follow this trend! Why? 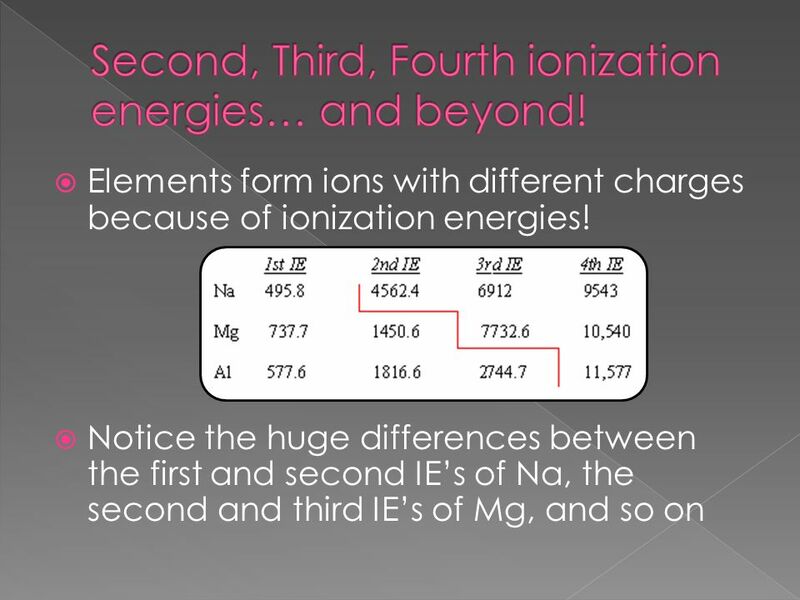 12 Second, Third, Fourth ionization energies… and beyond! 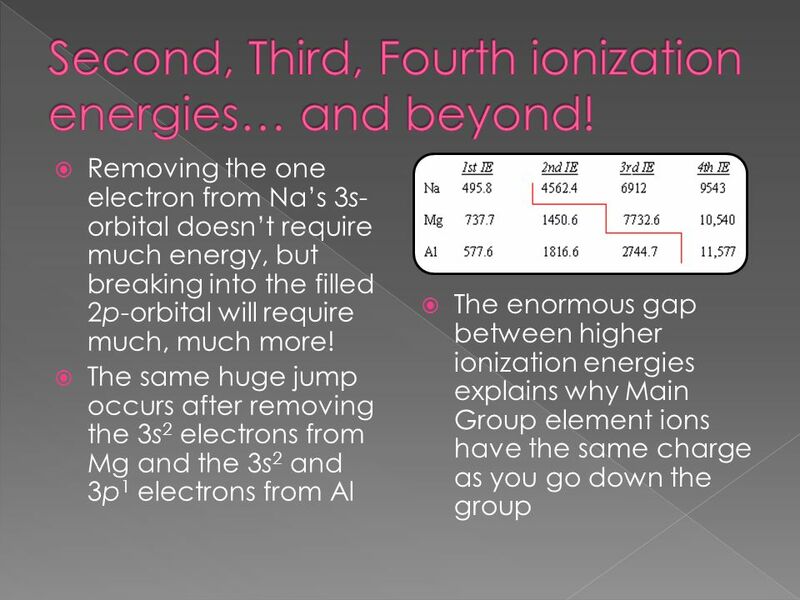 13 Second, Third, Fourth ionization energies… and beyond! Download ppt "Esther Jun, Claire Lee, and Eunhye Oak"
Atomic Structure Ionisation Energies. 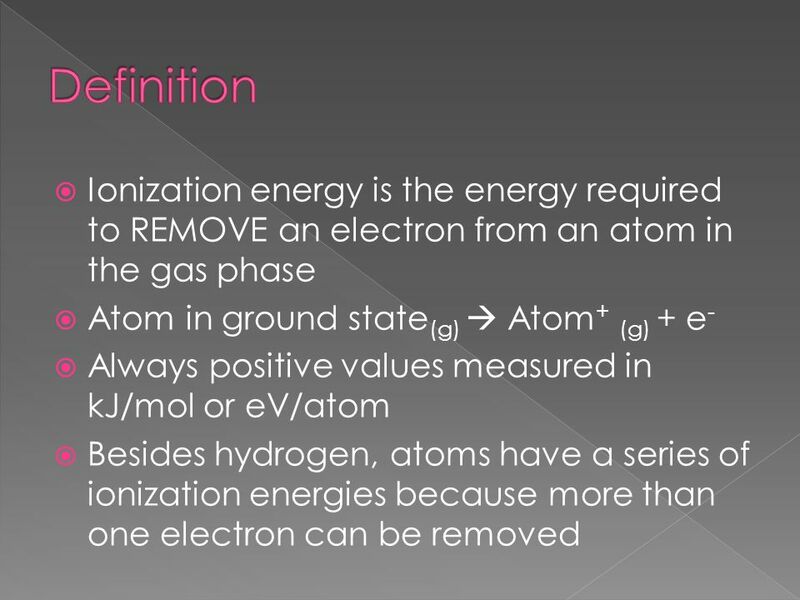 Ionisation Energy The first ionisation energy of an element is the energy required to remove completely one mole. The Periodic Table. 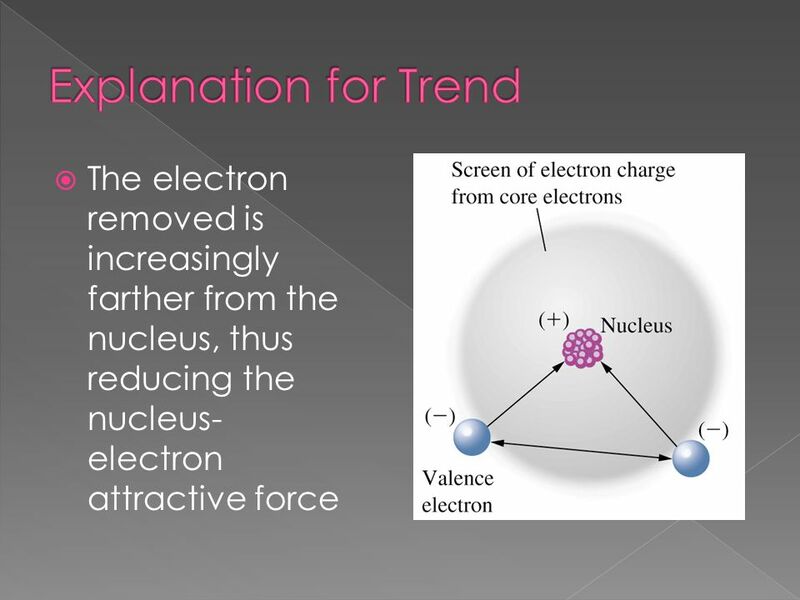 Force of Attraction: Valence Electrons (Outer-Shell Electrons)  Electrons that can participate in the formation of chemical bonds. Bhavik Patel. 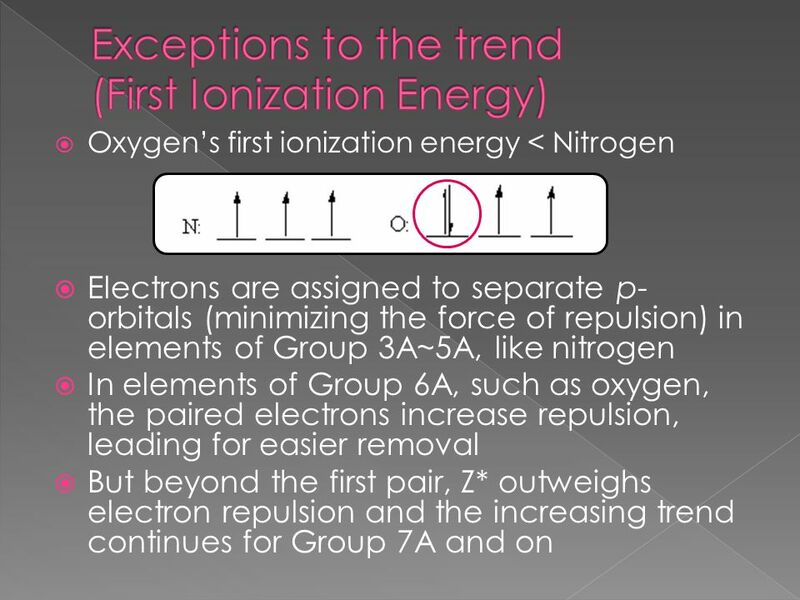 The diagram shows the first ionization energies for the elements from Li to Ne. Briefly (in one to three sentences) explain each of the. Homework Private study work (bring notes to show me next lesson); Read pages 40 – 41 in your text book and complete the practice questions on each double. Periodic Table Trends. Metallic character Metallic Character Depends on how readily the element gives up their valence e-’s. The Periodic Law says: PERIODIC LAW states that when elements are arranged in order of increasing atomic number, there is a periodic repetition of their. 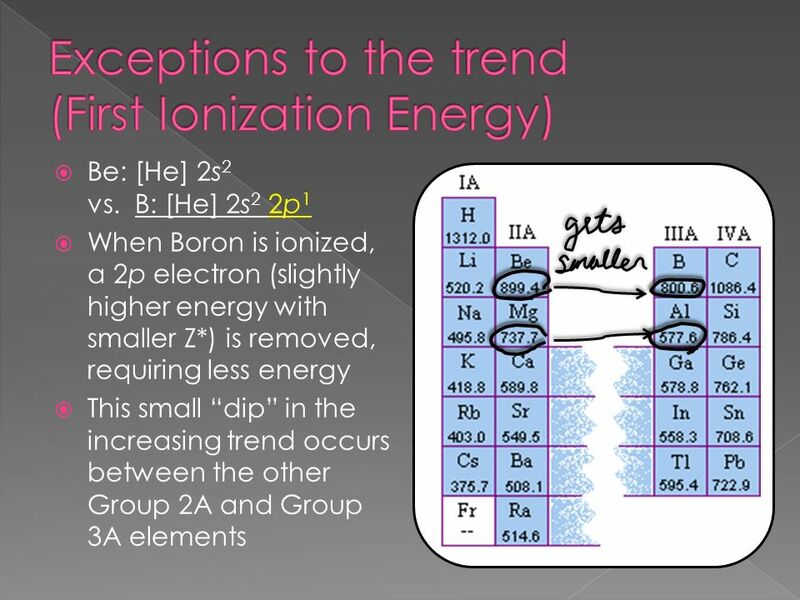 Ionization Energy Explain how evidence from first ionization energies across periods accounts for the existence of main energy levels and sub-levels. 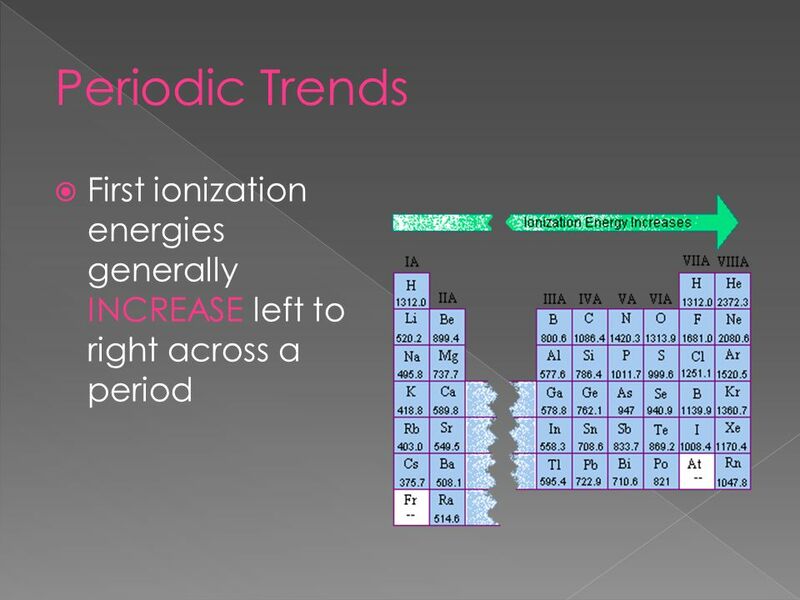 Lecture 5 Trends in Atomic Properties. Energies and sizes -The first ionization energy (IE) of an atom (M) is the energy required to form the positive.